The caduceus is one of the most ancient of symbols. You might best know this symbol as the DNA structure and healing used by the medical profession. 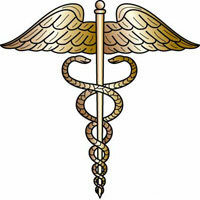 Since ancient Mesopotamia the caduceus presented two serpents intertwined (the central nervous system) around a staff (the spinal column) with the wings (the "swan") on either side (the two hemispheres of the brain, with the circle in the center representing the pineal gland, or the central sun and psychic center within). It also symbolized the kundalini energy. Biblical writers called the healing serpent Nehushtan. The Hebrew word for serpent is "nahash." The root of the word are the Hebrew letters Nun, Het and Shin, which means "to guess." This was translated into other languages as "satan," which some say mean "enemy," or "adversary." The name EARTH also comes from EA/Enki. Actually, the name "earth" can be traced to Enki (a.k.a. EA), and "human" is related to Ninharsag/Ninhursag, who was Hathor (the House of Horus): HU (Horus) is also a transliteration of the ancient Sumerian EA (Grimms’ law of interchangeable letters and sounds). If we use Hebrew, HU means "she." India, the "nagas" were the serpent gods and goddesses. In the Americas there was Quetzlcoatl (or Thoth). The entire world has worshipped the serpent for its wisdom, but ironically, it was not really about snakes at all - unless you feel you have to "guess" what a snake is up to! Why was the snake chosen? For its cleverness, ability to survive in the harshest of environments, and again, its shape resembling the flow of energy up the spine - to the crown chakra, and the third eye. The snake sheds its skin and is reborn. The snake is clever. And perhaps because it naturally instilled a bit of caution or awe in people. Was Enki really a snake? Not literally. He has many different appearances. The serpent always represents spiritual wisdom, life and healing. The first symbols of serpents were attributed to Enki and then Ninhursag. However, the story of the serpent becoming an evil symbol began with the wars between Enki and his brother, Enlil (later known by the name "Allah"). These conflicts began at birth and had to do with birthright to the royal throne of the Nibiruan civilization in which their father, Anu, was the leader and father to Enki and Enlil. There was a time when Anu felt Enki (due to his wisdom and magical abilities) was the only savior of the Anunnaki people ("Enuma Elish"). This story later was reflected in Cain and Abel, and all the stories throughout your times of brothers competing for power, favoritism and inheritance. Enlil’s anger with Enki caused him to twist the truth around to make the serpent evil, which later became what you know as the story in the Bible. What you think of as being Satan is not that at all, but THE REVERSE! Although there was love between Enki and Enlil, they often did not see eye to eye on many issues, especially when it came to supporting human beings. Enlil never had patience or compassion for people, and on several occasions, Sodom and Gomorrah as one example, he literally nuked them out of existence. He attempted this again during the time of the Great Flood but Enki (and those who supported him) took swift action to alert the Noahs around the planet of the forthcoming dangers. Some of the Anunnaki outraged with Enki for doing so but saw they had little choice in finally carrying out the rescue. Anu supported saving humanity. In the Garden of Eden situation, Enlil was furious that Enki permitted humans to have access to knowledge, the mixing of the Anunnaki with human genes, thereby becoming more "godly," and equal to the Anunnaki. To strike back at Enki, and in the attempt to regain his power over humans, Enlil vowed to tarnish Enki’s reputation by spreading the idea that the serpent of wisdom was evil. Enlil tried to wipe out knowledge of the DNA coding Enki gave humans, and of what the Anunnaki used in order to have longevity (gold). However, Enlil was not completely successful because most of Enki’s plan had worked. For centuries afterwards, humans attempted to duplicate the concoction of gold the gods used to maintain their youth and health, and those with the knowledge were able to manufacture substitutes for a while. But, much also had to do with the DNA content of the individual. The more pure Anunnaki DNA, the better chance one had of having longevity, etc. Then, combine the DNA with spiritual awakening to the body, blood, and spirit with nutritional supplements, and each human will know who they are - gardeners, and caretakers of the Earth, not owners. Humans are here to maintain beauty, harmony and balance that was first given to us after the Earth was created. We are not to be interested only in ourselves. "With the Tree of Knowledge humans had the chance to figure out everything on their own in time, to be equal to the Anunnaki. Had they eaten only from the Tree of Life, they would live but not have been more the wiser." The Garden of Eden, by the way, was a literal place, but also a genetic metaphor. Enki knew had Adam (Adapa) eaten from the other tree, it would not ensure wisdom or spiritual evolution. Instead, it would more likely result in primitive human living for eons without evolution. The story of this translated from the ancient Babylonian texts is very interesting with Adapa’s confusion over whom to believe, which to eat. It resulted in him eating "the wrong" thing, but actually it was the right thing, in terms of DNA, which would eventually bring our spirituality back from whence it faltered, and remind people to tend to the Earth, which was not created by extraterrestrials, but by God. The battle between the brothers continued into the time of the pyramid wars and Exodus. The staff with the caduceus was also one of Moses’ tools. The serpent, for the Hebrews represented salvation and wisdom. Moses’s copper serpent staff, often utilized by his brother, Aaron, was made famous for performing miracles. Another connection between the staff and the serpents occurred during the Exodus when the staff was seen to transform into snakes. Aaron was high priest and had been trained in magic. He and Moses received instructions from a collective of that main Anunnaki family (who taught Moses the alphabet). Isn’t it interesting that during the Exodus, the name Jehovah, YHWH, took over and the name Adonai began to disappear? This was at the time when Enki departed the Earth and Marduk became the leader of Enki’s family. Enlil’s family was given the Sinai (taken away from Ninharsag) and Enlil’s son, Sin, was its new ruler. His symbol is the crescent moon (which became the symbol for Islam). Luckily, the heritage of the caduceus lived on. In some versions the staff is capped with a solar disk or even a crescent moon. Nisaba, one of Enki’s daughters, also held a similar staff topped with an "ankh." For some, the staff symbolized Hermes/Mercury. Throughout time different civilizations in India, the Americas, Greece, Egypt, including the great mystery schools and secret societies have renamed and used it. In Christianity the archangel Michael was associated with this staff. The sirens became the staff for two serpents they held in their hands. This staff was considered to be so powerful it was able to raise up the dead. The symbol of the caduceus was later transferred to one of Enki’s counterparts, Ningishzida (Thoth), the healing god, and then to others of his family because it was a code for the bloodline of Enki’s heritage. From this symbol of the serpent the power was transferred to the symbol of the dragon, who continued to hold the knowledge. The dragon could "divine." This is one reason why we say we and you are of "divine" heritage. You will see a version of the caduceus as the winged solar disk in Ancient Egypt, which incorporated the knowledge of one’s divinity and eternal soul, in the third eye chakra, along with the traditional knowledge of what it stood for. Therefore, you will see this symbol above arches and entrances into temples and royal structures to remind those who enter who they really are. And this means not only the DNA connection to the Anunnaki, but the divine soul-being as coming from the Source, itself. The symbol of the winged Isis represents the original female mother goddess, Ninharsag, and blood connection in birthing humans who mated with "the gods," those who fly as a free spirit. When you see the caduceus, know you are triggering your own genetic memory and seeing your heritage. Each one of you holds within you the DNA, in varying degrees, the wisdom from the Anunnaki and the Source. Since Enki and Ninhursag, there have been other off-planet beings who added in their own DNA to the human species. So, you are all a mixture - and all one family from the One God. Within you is the consciousness with which you can liberate yourselves through SELF-knowledge and return to the garden.